Team Liquigas-Doimo’ Peter Sagan does not talk much. When asked about this, team director sportif Stefano Zanatta explained, “He is very humble and is always respectful.” As he should be, he is a first-year professional, only 20 years old, far from his home in ?ilina, Slovakia, and racing in a ProTour-level team alongside Ivan Basso and Daniele Bennati. Sagan, though, has already made a name for himself. In his first professional race last month in Australia he rubbed shoulders with Lance Armstrong and fought for victory with World Champion Cadel Evans. Liquigas-Doimo fielded Sagan as part of its team for the Tour Down Under, a five-day race kicked off with a criterium two days earlier in Adelaide. At that criterium, he joined an escape group with seven-time Tour de France winner Armstrong. It lasted only 20 minutes, but it left its impression on him. di Piave, Italy, playing Call of Duty 2 on his PlayStation and talking to his girlfriend Radka in Slovakia. But the criterium was only the beginning. Sagan sprinted on the uphill finish of a sizzling-hot stage three to Stirling. 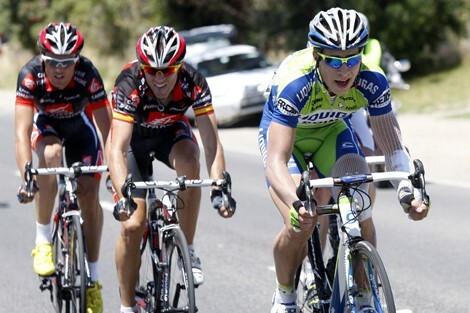 He battled with Evans and Vuelta a Espa¤a winner Alejandro Valverde, finishing just behind them in fourth. This was despite the fact that he was racing with 17 stitches down his left arm, a reminder from the previous day’s crash. Pretty “cool” and tough. The race wasn’t over for Sagan, though. In the Tour Down Under’s queen stage to Willunga he joined an attack over the last climb with Evans, Valverde and Luis Le¢n S nchez ? all Tour de France stage winners. The four fought to hold off the sprinters’ group over the next 20 kilometers, with S nchez nipping ahead for the win as the others were caught in the last kilometer. But Sagan left an impression. “I tell you,” said Armstrong afterwards, “this young Slovenian is showing a lot of talent.” Armstrong was mistaken on Sagan’s nationality, but that was all. Sagan had let his legs do the talking. He has been at the top before. He won the cross-country junior title two years ago at the mountain bike World Championships in Trento, Italy. “My brother, Juraj, got me into racing,” said Peter on a freezing-cold day from his Italian base. “He started cycling first, won some small races and then I started about a year later, when I was nine years old. It was at the World Championships in Trento when Liquigas-Doimo’ Zanatta started to follow Sagan. After watching Sagan’s progress through the end of the 2008-year the team offered him a three-year contract (2010 to 2012). Zanatta and Team Manager Roberto Amadio plan to develop Sagan slowly and without pressure. Friday, he will travel to the team’s training camp in Tuscany and support Bennati at the GP Etruschi Saturday. Liquigas-Doimo has filled the rest of his spring race schedule with mostly one-day races: Trofeo Laigueglia, Omloop Het Volk and Kuurne-Brussel-Kuurne, Giro del Friuli and Eroica. The team is unsure how Sagan will develop, but they compare him to Damiano Cunego, short, with rather large, muscular legs. And certainly, fighting for the win with Valverde and Evans at the Tour Down Under makes Sagan a favorite for the Ardennes Classics and stage races. And the Northern Classics, like Paris-Roubaix? Two months before Sagan won his World title in Trento, he fought to win the junior’s “Hell of the North”, Paris-Roubaix. Sagan wants to return to Paris-Roubaix and he wants to confirm his show of strength at the Tour Down Under throughout this season.